From an historical perspective, no large sport utility vehicle can rival the Toyota Land Cruiser. The eight-passenger SUV has a long history, dating back 67 years ago when the Japanese automaker was looking for something to rival the Jeep for usage in the Korean War. In fact, when Toyota developed a prototype Land Cruiser in January 1951, it was called the Toyota Jeep BJ. The new name and release of the first Land Cruiser came in 1954. Although it’s fairly easy to navigate around town, where the 2019 Toyota Land Cruiser really excels is in off-road situations or snowy weather. Those original vehicles looked exactly like a Jeep and had no physical resemblance to the modern Land Cruiser, a huge three-row SUV that remains fairly popular overseas. Although once considered at or near the top among large SUVs in the U.S., sales of the Land Cruiser have plummeted with the arrival of better-equipped, more luxurious SUVs. The Toyota Land Cruiser even finds itself competing with the LX570, a far more sophisticated SUV that is produced by Toyota’s luxury division – Lexus. The LX570 has some suspension differences, is better refined, and has a far superior interior cabin makeup. Despite its popularity worldwide (it remains huge in Australia), the Land Cruiser is outdated. Toyota needs to do a major redesign, something that hasn’t been done since 2008. With the exception of its off-road enhancements, everything about it seems dated. The Land Cruiser has certainly lost its luster in the U.S. There were only 3,235 Land Cruisers sold in the U.S. during 2018. That’s a huge drop from its “heyday.” During a seven-year stretch between 1994 and 2000, Toyota sold between approximately 11,000 to 18,600 Land Cruisers in the U.S. on a yearly basis. 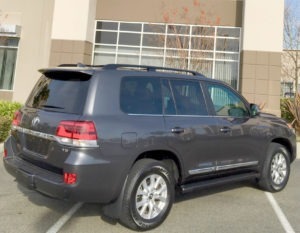 The 2019 Toyota Land Cruiser is almost identical to the 2016 model that was refreshed. For a big, bruising SUV, the Land Cruiser delivers a comfortable ride, has good performance, and features a cabin that is easy to master. But that’s one of its issues – no one who enjoys technology would ever consider buying this simplistic SUV. Two other negative aspects of the Land Cruiser are the pitiful gas mileage – an estimated 13-18 mpg – and its hefty price tag of nearly $88,000. Even with a 24-gallon tank the Land Cruiser will barely last a normal week of driving without requiring a fill-up. Although we find it fairly easy to navigate around town, where the Land Cruiser really excels is in off-road situations or snowy weather. It can plow through snow drifts almost effortlessly and performs fantastically when given the opportunity to go off-roading. The standard Land Cruiser comes with a full-time four-wheel-drive system. It also features a lockable center differential, crawl control and active Multi-Terrain Select that greatly enhances traction. Also standard are hill descent control, hill start assist, Toyota’s Kinetic Dynamic Suspension System, Multi-Terrain Select, skid plates, and tow hooks. Towing capacity is near the top of its class at 8,200 pounds. The 2019 Toyota Land Cruiser has one engine, a 5.7-liter, V8 engine that generates 381 horsepower and 401 pound-feet of torque, and is paired to an eight-speed automatic transmission. It travels 0-60 mph in 7.4 seconds, a respectable time for its class. The Land Cruiser displays better-than-average handling and excellent braking for such big hauler. And it is also easier to maneuver in and out of parking spaces than most large vehicles. Among its competitors like the Chevrolet Suburban, GMC Yukon, Land Rover, Cadillac Escalade, the Land Cruiser doesn’t match up from an interior perspective. The cabin is devoid of sophistication and is lacking in size, most notably the two back rows. The third row is strictly for kids and shockingly doesn’t fold to the floor, which uses up much-needed cargo space. The cargo area is 16.1 cubic feet for all rows employed. If Toyota wants to keep the pioneering Land Cruiser relevant, a redesign is needed. At least in the U.S. market, where it currently has a narrow audience and the competition keeps distancing itself with upgrades.